The Converse Cabin is located near the mouth of Netarts Bay, and offers direct access to a quiet, nearly private beach. The breathtaking panoramic view of Netarts Bay and the Pacific Ocean makes this beach house a wonderful place to stay no matter the weather. Located seven miles west of Tillamook, the sleepy community of Netarts is a hidden jewel of the Oregon Coast. Netarts offers guests an uncomplicated coast experience, with plenty of adventure to be found within a short drive. During July and August the check in is 3 pm with check out at 11a.m. During October through June check in is 4 pm with check out at 12 noon. For large groups our next door neighbors' cabin may also be available for rent. Description: Our home is a 3-story oceanfront. There are 1200 square feet on the 3 levels. The beach is in our back yard. There are 2 bedrooms with queen sized beds and 2 bathrooms on the first floor. The whole West wall is glass in the bedrooms. There is a spiral stair to the great room on the second floor. The great room has a living room, dining room and kitchen. The whole West wall is glass with breath taking views of Netarts Bay and the Pacific Ocean. There is a deck off the dining room with patio table, chairs, recliner and gas barbeque. The kitchen is fully furnished. We have a Jenn Aire Range, dishwasher and microwave. There is a 1/2 bath on the second floor and a stair to a bedroom on the 3rd floor with double bed. There is a path to our sandy beach with driftwood. You can rent a boat with 3 crab pots only 6 blocks from our home and go crabbing in Netarts Bay. You can dig for clams in our back yard. Tillamook is only 7 miles away for your shopping needs. We even provide the firewood for the cone shaped fireplace in the middle of the great room. The following is a letter from one of our renters. We returned last night from beautiful Netarts. Here's the key to the house, with our gratitude. I signed the guest book but want to reiterate that we loved your warm, cozy cabin with the jaw-dropping view. We loved the happy spirit you created with the travel photos, and the eclectic touches, like the Apple Pie neon sign, which added a rosy glow to the nights. The amenities you provided were fabulous and welcoming. You created such a warm, welcoming atmosphere, making the visit extra relaxing....... ..the star-filled nights were dazzling. --you bring enjoyment to all souls who have been lucky enought to accept your hospitality. Thanks so much, Gary and Pam for letting us rent your lovely home. We adored every minute and hope to return. Amenities: Jenn Aire range, dishwasher, microwave, coffee maker and grinder, toaster, blender, fireplace, cable TV, radio, washer and dryer, outdoor gas, deck off the dining room with a gas barbecue, phone. Activities: Crabbing, clamming, beach combing, bonfires, tennis, golf, deep sea, river and bay fishing and relaxing. Area: We have 2 small grocery stores in Netarts and Safeway, Fred Meyer, etc. in Tillamook which is only 7 miles away for your shopping needs. There are several restaurants in Oceanside and Tillamook. We also have the Tillamook Cheese Factory, which is the number 1 tourist attraction in Oregon. They have tours of the factory and serve ice cream. Smoking only outside. Pets with our approvel. 180 degree views of the Pacific Ocean and Netarts Bay from our huge living room and bedroom windows. Private access path to the expansive and uncrowded sandy beach. toilet, shower, Counter with sink. We have free calls to the lower United States. We provide linens for the beds. We have 55 feet of parking along the street. We provide bath, hand towels and wash clothes. We also kitchen towels. 8 foot leather davenport, leather chair and ottoman, coffee table and another table. We have a pot scrubber dishwasher. We have a 17 cu foot refrigerator. Jenn-Aire range with oven. The range has a barbeque and griddle inserts. It is part of the stove. We have a counter top microwave. .We have a kitchen with a stove, refrigerator, dishwasher and double stainless steel sink. We have a dining room with table and 6 chairs. We have a 36 inch flat screen TV in the living room and a 20 inch TV in the master bedroom. Both are on Charter Communication cable. View of Netarts Bay and the Pacific Ocean. Their is a tennis court at the Tillmook High School. Their are a couple if golf courses in Tillamook. There is nothing fancy about this house, but the five star review is well deserved for the location of this funky 70's beach cottage. Tucked 40 feet up a short bath, the living room and two bedrooms of this place all have stunning views to take in the sea bird, seals and tides. From the home you can see the ocean and the estuary, and it is fascinating to watch the tides march in and out. This home is not accessible because it has a spiral staircase, so anyone with mobility issues should not consider this place. It is also only two bedrooms, but they are comfortable. The home has the basics, but barely, and it is a bit threadbare, but it is charming and if you are not a fussy person, this is the perfect place to spend a weekend. The 12 pm check out is a bonus! The view is amazing, the windows of the cabin are incredible, we loved waking up to a full view of the bay. The cabin was very cozy and had everything we needed. Amazing views and a charming beachfront home. Enjoyable long weekend with beautiful bay & ocean views. The home had all the amenities we could have asked for. There is a fairly easy direct beach access for those without knee problems. The beach cabin is a perfect location for exploring the beautiful three capes area. We saw two bald eagles as well as herons and egrets from the deck and expansive windows. We would definitely consider renting again. Thank you for sharing your beach cabin with us. Fantastic view, nice central fire place, has everything you need. A little funky but very livable. Open spiral staircase a bit dangerous for small dogs and children. Private path down to the fantastic beach where you can walk 30 min to a restaurant either way. Nice little spot . Beautiful view ! Amazing views day and night inside and outside in every aspect of this house. Walks on the beach, watching the tidal changes, sunsets and the stars and moon. Well stocked kitchen, fireplace with wood included!!! Just an amazing place. 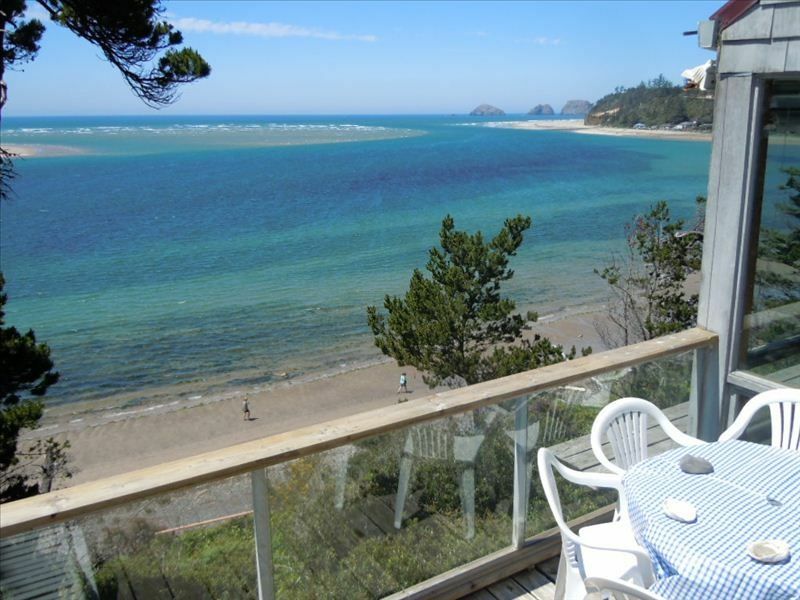 We have beautiful 180 degree views of the Pacific Ocean and Netarts Bay from our living room, loft and 2 guest bedrooms. We charge $100 for cleaning.